LYNN, Mass. 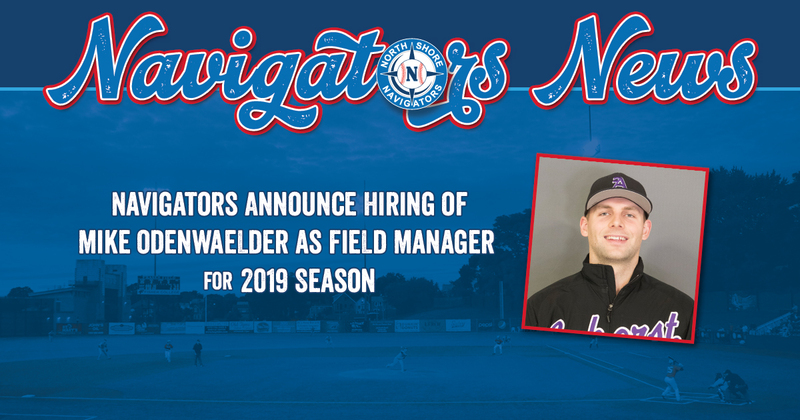 -- The Futures Collegiate Baseball League’s North Shore Navigators have hired Amherst College assistant coach and former Baltimore Orioles minor leaguer Mike Odenwaelder as their field manager for the 2019 season. Assistant General Manager Joe Gill, who headed the managerial search, made the announcement on Wednesday. Odenwaelder becomes the fifth manager in the Navs’ FCBL era and takes over for Gordon College assistant Todd Alford, who guided the team to 20 wins during the recently completed 2018 campaign. He brings a wealth of experience to the position, including two summers (2013-14) playing for the FCBL’s former Torrington Titans. As a rising junior, he hit .370 with 49 RBI to win the FCBL's batting title and Most Valuable Player honors. Odenwaelder serves as the top assistant coach and recruiting coordinator for the Mammoths, who recently hired former Worcester Bravehearts skipper and reigning FCBL Manager of the Year JP Pyne as head coach. He played two professional seasons and then returned to school for two fall semesters, completing his Environmental Studies degree last fall before taking a position on the coaching staff in January. The Goshen, Conn., native helped manage the position players and pitchers, construct lineups, and assist with all aspects of recruiting for Amherst, working as part of the NESCAC Coaching Staff of the Year last spring. The Mammoths earned their first league championship since 2013 and fourth overall. Odenwaelder managed the entire Amherst program as the only coach on staff after Brian Hamm departed in July to take over at Eastern Connecticut State. Odenwaelder spent the most recent summer months as the head coach and co-program manager for the East Coast Clippers out of Raleigh, N.C. In 2017, he worked as a trainer assisting college and professional basketball players at IMG Academy in Bradenton, Fla.
Amherst advanced to three NCAA tournaments and won one NESCAC championship during Odenwaelder’s playing career. Individually, he earned two All-America honors, a Rawlings Gold Glove, two NESCAC Player of the Year titles, and one NESCAC Rookie of the Year. The Orioles then selected him in the 16th round of the 2015 MLB Amateur Draft. Odenwaelder earned two All-State honors each in soccer, basketball, and baseball at Wamogo Regional High School in Litchfield, Conn., before attending Canterbury School as a postgraduate and achieving All-New England Prep status in all three sports. While the past season at Fraser Field is just weeks in the rearview, preparations for 2019 and Odenwaelder’s North Shore managerial debut are well underway. Stay tuned to the Navs’ website and social media accounts for news on player signings and other important announcements throughout the offseason.